Dental sealants are plastic coatings that are usually placed on the chewing surface of the permanent back teeth, or the molars and premolars. These sealants help protect the back teeth from decay. The chewing surfaces of the molar and premolar teeth have grooves — “fissures” — that make them vulnerable to decay. These fissures can be deep, are difficult to clean, and can be more narrow than a single bristle of a toothbrush. Plaque builds up in these areas, and the acid from bacteria in the plaque attacks the enamel and cavities can develop. Fluoride helps prevent decay and helps protect all the surfaces of the teeth, dental sealants provide extra protection for the grooved and pitted areas by providing a smooth surface covering over the fissured area. The first dental sealant to be placed is usually on the fissure of the first permanent molar tooth, once the chewing surface of the tooth has erupted completely beyond the gum. This tooth grows in behind the baby teeth. If the chewing surfaces of these teeth are sealed, the dental sealant will help protect the tooth. Except for the wisdom teeth, which come through much later, the molars and premolars continue to erupt until eleven-thirteen years of age and the chewing surfaces of these teeth can be sealed after they have erupted beyond the gum. We take great satisfaction in helping you maintain optimal oral health. Our practice is devoted to comprehensive and preventive patient care. 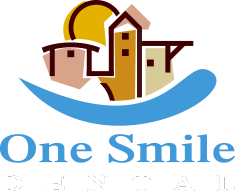 Copyright © One Smile Dental 2018. All rights reserved.